The Nelson Cigar Criss-Cross Bubble Pendant is part of the Nelson Bubble Lamps, a series of lighting fixtures in charming, spherical shapes. 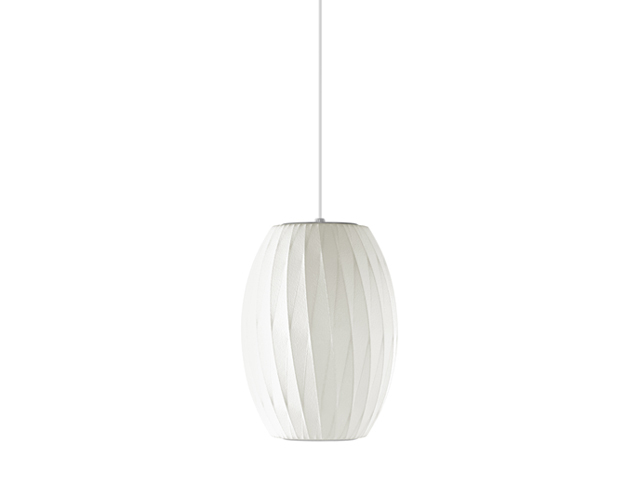 The elongated sphere of this lamp has an interesting criss-cross pattern in its underlying structure. George Nelson, inspired by a set of silk-covered Swedish hanging lamps, designed the series in 1952. All sizes, except small, use with up to 32 watt CFL bulb. For the small size, use with up to 13 watt CFL bulb. Light bulb not included. Hardwiring required. The Nelson Cigar Criss-Cross Bubble Pendant is available in two sizes, and comes with a brushed nickel-plated steel ceiling plate and a 6-foot cord to attach it to the ceiling. George Nelson first designed the Bubble Lamps in 1952, when he came across a Swedish hanging lamp that he wanted to acquire for his office. He was challenged by the expensive price and decided to make his own. The result was a series of elemental, spherical shapes including a rounded apple, a wide saucer, and a shapely pear. Use with up to 13 watt CFL bulb. Light bulb not included.